I think it was about this time last year when I first got interested with credit cards. I really wanted to get one to help us tide through some time when cash is really tight. Armed with an online job I have for more than a year, payslips and proof of income, I searched for banks that accepted online credit card applications. Unfortunately, BPI (the only bank that entertained my online application) doesn't recognize payslips from foreign employers or proof of income from online/stay-at-home workers. (which I think they should! Online workers tend to earn more than office-based employees!) However, they advised me to avail of their company's Express Start Program. What is BPI Express Start Program? 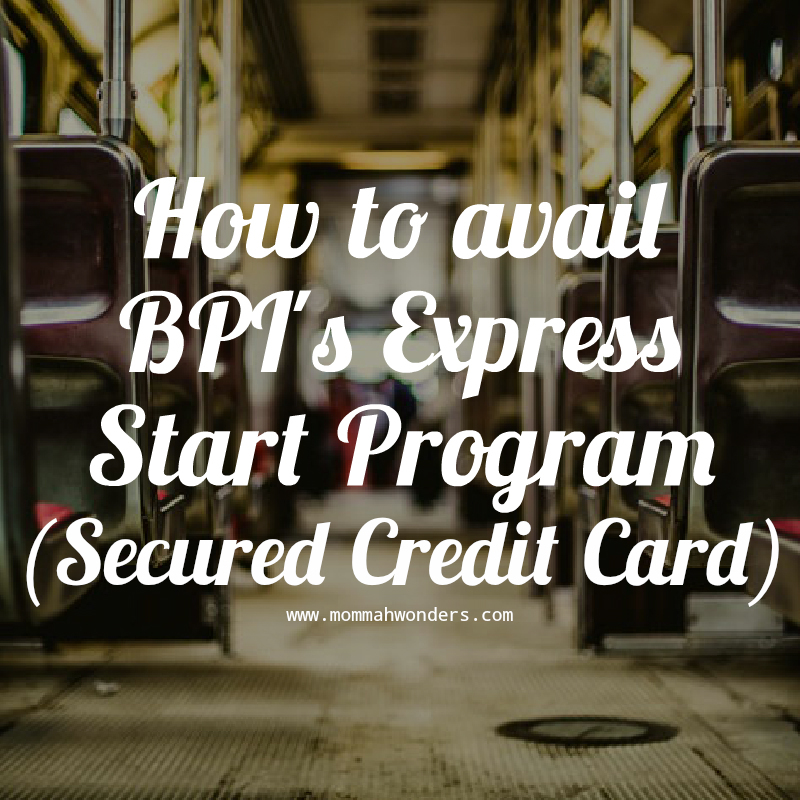 The BPI Express Start Program is the bank's program for people who want a credit card but doesn't have all the requirements that regular credit card applications ask for (i.e. payslips, COE, tax returns etc). You only need a hold out amount which will be the basis of your credit limit. BPI's Express Start Program grant a credit limit equal to 80% of the amount you deposit. If you want a high credit limit, you will need to deposit a bigger amount of money. Regular credit cards on the other hand don't require initial deposits and money hold out for it to be released or granted. If you have payslips, COE and tax returns you can present to the bank and have no bad credit history, the regular credit card is for you. However, please be reminded that not all regular applications are approved. After the bank's advice and reading more information about secured credit cards, I patiently waited until December so I can use some of my 13th month bonus to fund the secured credit card. When I finally got the funds, I went to my local BPI branch and told the bank personnel that I wish to avail of their Express Start Program. The bank personnel asked if I already have an account with them and I said yes. Since I am already a depositor, I didn't need to open a new savings or time deposit account. I was simply asked to fill out the application form and an Affidavit authorizing the bank to hold out 12,500 PhP from my account which will serve as my collateral for the card. I only needed a photocopy of a valid ID as well. In less than an hour, I finished the deposit, affidavit and filling out the application for the secured credit card. According to the bank personnel, it takes 2-3 weeks for the application to be processed and for the card to be delivered to your chosen address. Since I applied during December (a very busy month! ), I received my card by the 2nd week of January. I picked it up in a BPI branch since their courier didn't find our house. And that's it! Pretty fast and easy, right? If you have questions or if you want to know more, do not hesitate to ask and I will try my best to answer them. DISCLAIMER: I don't work for BPI and this is not a paid post. Everything written is my personal experience and all opinions are mine. Sounds interesting!! I've been thinking of opening an account with them for my daughter. This sounds like a good option for me. At least, they are sure that you can pay for your purchases. Is this different from debit cards? 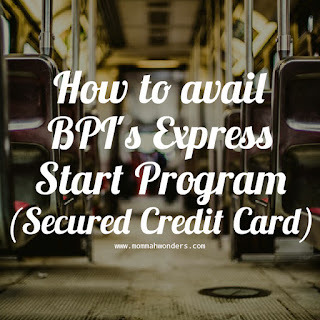 When I was a fresh grad and started working, BPI offered me to fill up a form for credit card. Then after few weeks I received a letter to open an account to get my credit card. (I have existing account na) They are offering me a secured credit card which I declined and when I went back they offered me to fill up the form again and they submitted it, fortunately they gave me a regular credit card. Kaloka lang, depende sa mood siguro ng mag approve. Yes, I think so too. Minsan nga if you open an account with them and you deposited a certain amount they automatically give you a credit card (some don't even fill out forms!) I talked to a BDO CC officer and she said if the bank sees that you have a steady flow of cash to your account and it maintains a certain sum (say 20-30k per month) for at least 3 months, your branch automatically refers you to their credit card department. I have to agree, Dean! I recently tried to apply for a regular CC since I am employed by a Philippine company (though I still work at home) for almost a year now... Guess what? Declined pa rin kasi I mentioned I work from home! Nag pass naman ako ng payslip ko with all the deductions etc pero wala pa rin. Good to know about this product by BPI. I am also a work at home mom and my husband is unemployed. Buti na lang, we still have our credit cards, which we got when my husband was still working. At least, with this type of credit card, you know your limits and may be forced to keep it. We have an account with BPI but they're just the regular savings account. I'm not sure if CCs are for me, I always prefer a debit card kasi I know myself, minsan hindi ko macontrol ang sarili ko pag may nagustuhan ako. lol. Interesting.. first time that I am hearing about a secured credit card also.but good that you managed to get a credit card coz most places only accept credit cards especially when you are buying things online. I am thinking of having a BPI account under my name. All our accounts kasi except my payroll account is under my husband's name. Mayroon ba syang annual fee sis? I'm still thinking of getting credit card. I just don't want to spend an amount that's not yet in my hands. I guess once I got married, it will be different.